In partnership with NBC4/WCMH-TV, Fayette Humane Society announced Thursday that 11 animals found new homes during Clear the Shelters – the popular pet adoption campaign that launched in July and culminated on Clear the Shelters day, Saturday, Aug. 19. Clear the Shelters is a national pet adoption campaign spearheaded by NBCUniversal Owned Television Stations, a division of NBCUniversal. “We had a successful number of adoptions during the event with 10 cats and one dog finding their new family. This allowed us to free nearly 50 percent of our capacity limit in our adoption center,” said Brad Adams, outreach director. All of the adoption fees for the cats and kittens were reduced to $20 during the national event. An adoption fee for a cat is normally $50 and $75 for a kitten. Those fees cover the cost of their spay or neuter surgery, vaccinations, flea prevention, FeLV/FIV testing, and microchip. Not only did local citizens adopt at the humane society during the event but they also had adopters from Hillsboro, Greenfield, Circleville, Galloway and Reynoldsburg. “The humane society is thankful for Mars Petcare who sponsored the event through a generous donation. This helped cover the difference of the reduced fees which will go back into the adoption program,” said Adams. The third-annual Clear the Shelters effort has helped inspire local communities to take action and open their homes to animals in need. Since the effort was expanded to communities all across the country in 2015, Clear the Shelters has resulted in more than 147,640 nationwide pet adoptions and 74,229 for the 2017 event. For more information about Clear the Shelters 2017, including photos and local pet adoption stories, visit www.nbc4i.com. To access Clear the Shelters participating markets, visit www.cleartheshelters.com. You can also follow the effort on social media by using hashtags #ClearTheShelters and #LoveMyPet. Taylor Harrington from Washington C.H. adopted Martha during Clear the Shelters adoption events. She was among other families in Washington C.H., Hillsboro, Greenfield, Circleville, Reynoldsburg and Galloway who adopted a new animal. https://www.recordherald.com/wp-content/uploads/sites/27/2017/08/web1_Martha.jpgTaylor Harrington from Washington C.H. adopted Martha during Clear the Shelters adoption events. 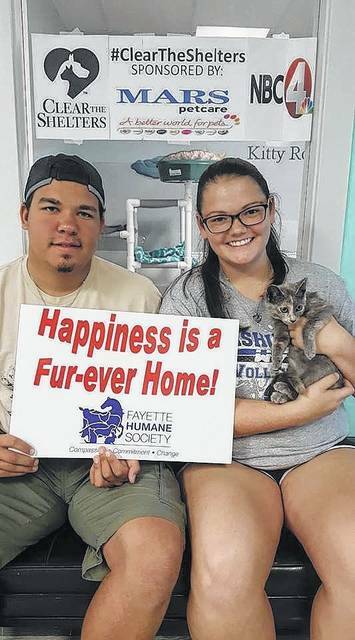 She was among other families in Washington C.H., Hillsboro, Greenfield, Circleville, Reynoldsburg and Galloway who adopted a new animal.